ALBANY – Barbara Ann McGinnis Nagengast, was called to eternal life with our Lord Jesus Christ on February 3, 2010, her family by her side. 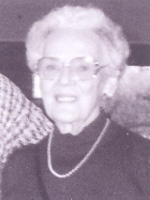 She was the loving and supportive wife of Emil J. “Skee” Nagengast Jr. who predeceased her in 1975. She joined her beloved husband on his birthdate. Born on June 28, 1928 in Stamford, CT, she is the daughter of the late Francis E.McGinnis and Martha B. McGinnis. She resided in Albany and attended Our Lady of Angels School and Vincentian Institute. She was a graduate of Pasadena Junior College, California. Affectionately known as Mud or Bobbie, she was generous with her time contributing to the family’s flower business and spent 17 years as a teacher’s aide at Holy Cross School. Through her life she was the respectful caregiver of many members of the last generation and several friends, and a dog sitter for her “canine grandkids”. Her home was a special place to many and we trust that the house of the Lord has welcomed her now. She will be greatly missed by her best friend Martha “Marty” Denninger, whose stories of the girls date back to their early childhood. Barbara’s loving legacy has been passed to her children Diane “Susie” M. (Michael Kelly), David K. (Marcie) and Denise “Neicy” A. (Gregory Weinman) and her grandchildren Pamela L. and David S. Nagengast. She is also survived by several nieces and nephews. Barbara is predeceased by her brothers James E. and Charles B. McGinnis. Barbara has received the loving care she deserved from her family, and a team of helpers. We would like to thank the girls who gave Mud daily comfort over the past year: Mary, Marcia, Donna, Lisa, Deb and Judy. The compassion shown to her will always be greatly appreciated by those she leaves behind. Friends and family are invited to pay their respects at Hans Funeral Home, 1088 Western Avenue, Albany, on Friday, February 5th, from 4pm to 8pm. A mass of Christian Burial will be celebrated at All Saints Catholic Church (formerly St. Margaret Mary’s Church) 1168 Western Ave. at Homestead St., Albany, on Saturday, February 6th, at 12 noon. Interment to follow at Our Lady of Angels cemetery in Colonie. To leave a message of condolence for the family, view or print a prayer card, or obtain directions to the funeral home, please visit www.HansFuneralHome.com.